We should test all 2-year-olds for autism. Should We Screen All 2-Year-Olds for Autism? It’s actually not too early to assess them, and doing so might help close important socioeconomic and racial gaps around services and treatment. Jonathan Cruz had just started talking when, suddenly, he fell mute. But then Jonathan’s mannerisms started to change. He began flapping his arms when he became excited, and soon thereafter, as if overnight, the toddler lost his words. Cruz, who had worked for several years teaching kids with autism in a special needs classroom, noticed the shifts and, suspecting that they might signal a speech delay, promptly reported them to Jonathan’s pediatrician. 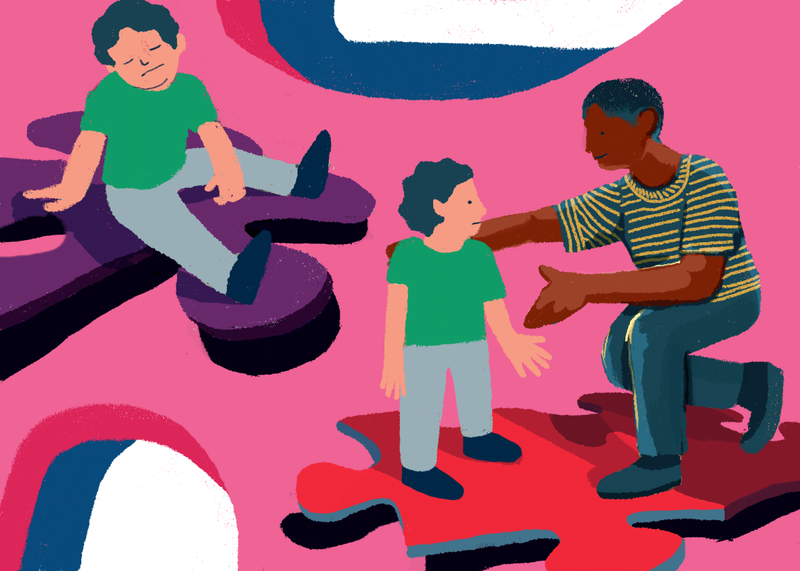 Two months and three specialist visits later, she learned that her son was among the estimated 1 in 68 children nationwide who have autism, a sweep of disabilities typically characterized by impaired communication and repetitive behavioral patterns. The diagnosis made Jonathan immediately eligible for state-funded, home-based early intervention services, including speech therapy. The sooner autism is identified, the sooner a child can start receiving services that might significantly shrink developmental gaps later in life. It follows that health professionals are pushing for early autism diagnoses. Recent research suggests that, by 2, toddlers can begin to reveal signs of autism: an absence of big smiles or, as in Jonathan’s case, an abrupt loss of speech and a lack of interactive gestures. But most children with autism aren’t identified until after they turn 3 (the median age of first diagnosis is 3 years and 10 months). By then, in most states, kids are no longer eligible for the array of services that Jonathan gets on a weekly basis—a delay that robs them of time that could have been used to catch up to peers. Jonathan was lucky—most youngsters, particularly Latino children, receive their diagnoses late. Research shows that black and Hispanic kids are less likely than their non-Hispanic white counterparts to be evaluated before 3, and that, on average, black and Latino children are diagnosed later than their white peers — with a delay of 1.4 and 2.5 years, respectively. Kids who communicate in a language other than English at home are 48 percent less likely than English speakers to be referred to early intervention. It’s a stark example of how children who haven’t even learned to brush their own teeth may already suffer due to the color of their skin or the language that they speak. As a little girl growing up in the Bronx, Cruz knew she wanted to be two things someday: a teacher and a mom. She became an educator in 2007 and has spent most of her career teaching special needs students at a majority-Hispanic public elementary school in the Bronx. Cruz could never have guessed that her work would be so useful when it came to raising her own son. She says that when she first told Jonathan’s pediatrician about the behavioral changes, the doctor didn’t take her concerns seriously. He thought that Cruz was overanalyzing the situation given her background in special education, she says, and attributed Jonathan’s speech delays to bilingualism. Since then, Cruz has enrolled Jonathan in as much therapy as possible, over 20 hours a week of four different kinds: applied behavior analysis (a widely used treatment that deconstructs everyday tasks), occupational therapy (which develops motor function and attention span), physical therapy, and speech. Some of Cruz’s students didn’t receive those services because their parents either didn’t know the signs of autism or didn’t recognize them as such. “There’s such stigma around the label,” Cruz says. “You have to overcome that to do what’s best for your child.” Years later, she says, those children now miss hours of learning time when they’re pulled out of class for therapy that they could have started sooner. A toddler with autism can be identified by a guardian, a pediatrician, or someone in public services, like a school district employee. Under the Individuals with Disabilities Education Act of 1990, states are required to locate and evaluate all kids with disabilities, including those as young as infants. In 2007, the American Academy of Pediatrics recommended that doctors screen all toddlers for autism at their 18- and 24-month visits, when indicators start to stabilize. Since then, the average age of diagnosis in some communities has dropped by roughly a year and a half, according to a 2016 study by researchers at Albert Einstein College of Medicine in the Bronx. Early intervention services can ease a toddler’s transition into preschool, and later, into kindergarten by giving him the chance to develop social and motor skills. He learns how to perform daily activities, like sharing meals and keeping tantrums in check. “The earlier the diagnosis, and the earlier the referral [to services], the better,” says Dr. Susan Levy, a developmental and behavioral pediatrician who runs the Autism Integrated Care Program at the Children’s Hospital of Philadelphia. Levy also chairs the autism subcommittee of the council on children with disabilities at the American Academy of Pediatrics. Too often, Latino kids like Jonathan aren’t given that opportunity. “There’s a lot of work to be done in offering full access and high-quality care to all children,” says Dr. Diana Robins of Drexel University, who pioneered the Modified Checklist for Autism in Toddlers, the most extensively studied tool used for population-based autism screening. Children of color are less likely than their white peers to receive quality health care. Studies show that nonwhite kids have lower rates of contact with primary care providers, a higher likelihood of having no consistent source of care, and higher odds of not being referred to a specialist by a health provider. Some Latinos, specifically, run into another obstacle: the language barrier. According to a 2013 study, just 1 in 5 California primary care physicians offered Spanish-language autism screening. Cruz, whose family is Puerto Rican, ran into a related but distinct problem when she relayed her concerns to Jonathan’s doctor, and he misread the baby’s speech delay as merely the product of bilingualism. Early signs of autism can masquerade as the typical struggles that bilingual kids confront when learning a second tongue: The key to distinguishing one from the other is knowing that a bilingual child with a learning impairment will struggle in both languages, not just one. The reasons for inequity in autism diagnoses extend beyond the health system. Whiter communities are more likely to have built-in support groups, advocacy organizations, and information networks to disseminate facts about the signs of autism, the importance of early diagnosis, and available services. Where you live also matters. Jonathan was fortunate: New York City is one of the best places nationwide for people with autism, due partly to a relative availability of services, according to a 2011 Autism Speaks survey. Other top cities are Los Angeles, Chicago, and Boston. Florida, Ohio, and Texas, on the other hand, ranked poorly. “Where’s the octagon?” Cruz asks Jonathan one morning during one of these sessions, pointing at a puzzle on the floor. She’s sitting, her feet tucked beneath her, on a living room couch at her home in the East Bronx. The shelves around her teem with books and toys—brightly colored gadgets, plush penguins, a children’s basketball hoop. Photos of Jonathan cover the walls: a newborn being snuggled by his mom; a toddler glancing quizzically over his right shoulder. The 2-year-old stares at Cruz from across the room as she repeats the question. “Where’s the octagon?” Jonathan turns to Laura Garcia, his speech therapist, who beams back and gestures at the puzzle, which features cardboard pieces of varying shapes and sizes. After a moment’s pause, he crouches, selects the eight-sided item, which is yellow, and the room erupts into cheers. Leaders like Godfrey Rivera are spearheading efforts to better connect underserved children with the services they need. Sinergia is one of three centers for parents of kids with autism in New York City that focus on low-income and minority populations. The nonprofit offers workshops, one-to-one advocacy, and a monthly Spanish-speaking support group for families. Rivera also leads outreach to child care centers, including some affiliated with Head Start, the federal preschool program for low-income children. But Robins says that doctors have an important role to play, too. In a recent study, she and her colleagues suggest that by ensuring all toddlers have access to autism screenings and following a standardized screening protocol, pediatricians can almost entirely eliminate racial disparities in diagnosis. Cruz knows that even the most robust services won’t guarantee that children on the spectrum will catch up with their peers. A study out of the Bronx found that just 1 in 14 toddlers who received early intervention services improved to the point that they no longer needed services in first grade. Still, she’s optimistic that intervention will mitigate Jonathan’s need for therapy later in life. In the meantime, there are concrete steps that can be taken by the public health and medical communities to reduce race-related disparities in diagnosis rates and help make early autism support available to all families who need it. Those include screenings for all 2-year-olds rather than just the ones parents or medical professionals suspect of being on the spectrum; improved access to translators and advocates who can reduce the language and cultural gap between parents and doctors; efforts to diversify the ranks of pediatricians and shore up their training in communicating with families of diverse cultures and backgrounds; and partnerships between the medical community and groups like Sinergia, who are doing much of the grass-roots work of reaching underserved families. We know that age 2 serves as a critical year for children’s intellectual and social development, and that’s even more the case for toddlers on the spectrum. We can’t rely on all parents to be as strong and knowledgeable advocates for their children as Jennifer Cruz. We need to fix the system.